The sump pit and waterproofing products we use are the best in the industry, made by Earth Contact Products (ECP). The bell shape of the sump pit allows for a greater amount of water to gather at the inlet of the sump pump system. Because of this design, the sump pump will run 40% less often, leading to a more efficient system. The sump pump runs less often and it allows more water to be removed when it is pumping, which will increase the life of the sump pump system. The basin will also need to be large enough to easily add an extra sump pump or battery backup system sump pump. 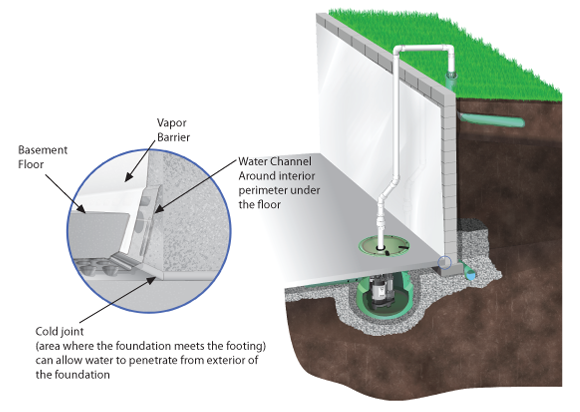 You may notice that some sump pump basins have perforated holes around the perimeter and some do not.The design of the entire waterproofing system will determine whether or not perforations are needed. In clay soil, the perforations will help remove water from under the slab. If the soil is sandy, these perforations can cause clogging of the sump pump system. Our team is professionally trained in basement waterproofing and foundation repair for our part of the country. A quality lid is a safety feature. Pets and children need to be protected from falling into the pit. An airtight lid will also prevent moisture and soil gases from migrating throughout the living space of the home. The purpose of the system is to remove water from the home, so a sealed sump pump lid is necessary. Our lids are see-through so the homeowner is able to look in to see if everything is functioning correctly. The lid has a gasket seal surrounding the perimeter which helps fight against noise and prevents moisture from entering the living space. If you have basement water problems you will be happy with a sealed sump pump basin or pit. A quality basin along with a battery backup pit will ensure dryness and worry free living in your home. 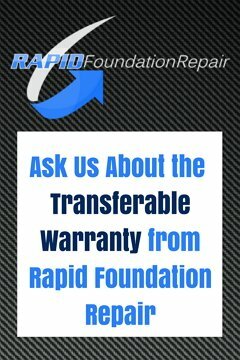 Contact the experts at Rapid Foundation Repair for your sump pit needs in South Dakota, Wyoming, and Nebraska.